I consider myself fairly familiar with Pac-Man and his lovely wife. I’ve had my fair share of experiences with both the classic Pac-Man game, Ms. Pac-Man, and a number of spin-offs. Admittedly, while I did enjoy most of the games in the Pac-Man franchise, I didn’t see too much staying power in any of them. For as fun as it was guiding the yellow hero through mazes, eating dots, and avoiding ghosts, I could only play Pac-Man for a while before I felt like moving on to something else. Pac-Man Championship Edition DX changed all of that and sent my conceptions about past titles in the series flying out the window. Namco Bandai has taken a sponge full of wonderful ideas and squeezed every last ounce of those ideas right out, delivering a Pac-Man game that takes the very basic formula it was founded on and expanding on it in several ways, all of which are incredible. Pac-Man Championship Edition DX takes the core foundations that made the game such an addictive quarter muncher so many years ago and pumps it full of style, improves on it with some effective modernization, and makes it more accessible, engaging, and rewarding than ever. 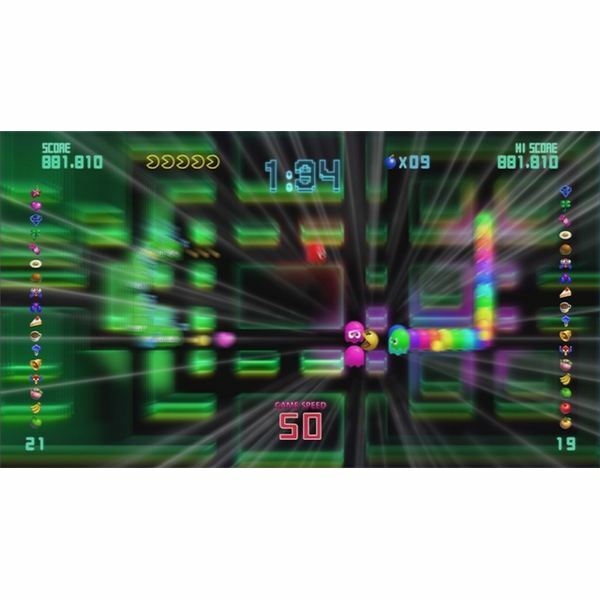 You guide Pac-Man through neon mazes, eating Pac-Dots and fruit while avoiding ghosts. Rather than just spawning and giving chase, ghosts are asleep throughout the maze. Passing by them wakes them up, and that’s when they go after the spherical protagonist. As you progress through the mazes, more ghosts appear onscreen, and the moment you pass them, they’ll join the line of ghosts that follows behind you. It then becomes a race for the Power Pellet, which gives Pac-Man the ability to eat the pesky other-worldly creatures for a limited time. The higher your score gets, the faster the action goes. It doesn’t take long for Pac-Man and the ghosts to start dashing through the mazes at hectic speeds. There are moments when you think you’re just a wrong turn away from running into a deadly ghost, thus losing a life and all of your momentum. But just as you're about to collide with Pac-Man’s undeniably charming enemies, the game kicks in its slow motion feature, which gives you ample time to turn around and avoid a nasty death. That is, of course, if you’re quick enough to react and avoid danger within the slow motion interval. If you’ve backed yourself into a corner and find no way to escape, even with the slow motion mechanic, hope is still not lost. With the press of a button (any of the face and shoulder buttons), you can set off a bomb that instantly sends all of those tenacious ghosts flying back to the center of the stage. This nifty little feature, in accordance with the slowdown mechanic, makes the game highly accessible. But don’t confuse accessibility with ease, because Pac-Man Championship Edition DX is all but easy. It starts off simple enough, but later stages and longer-lasting modes challenge you to stay focused as you aim for the high score. Pac-Man Championship Edition DX keeps its control scheme simple, and it’s all the better for it. You can use the directional buttons or either of the two analog sticks on the PlayStation 3 controller to guide the titular hero through mazes, and any of the buttons on the controller to set off bombs. And that’s pretty much it. The game remains accessible even in its control scheme, a control scheme that couldn’t be any more inviting, any more simple to grasp, and any more perfect. There’s a lot to be said about the look of Pac-Man’s latest gobble-fest. 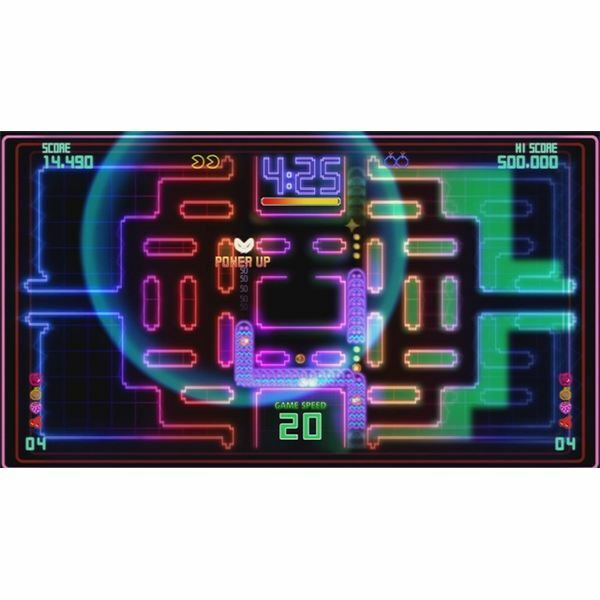 Mazes are designed ever so cleverly and feature a rich and enjoyable neon look. Everything seems to pop out and glow vivaciously, giving off a clean and polished look that’s just as full of live as Pac-Man and the ghosts (believe me, these ghosts are lively). Above all else, there is a remarkable sense of artistry in the game. 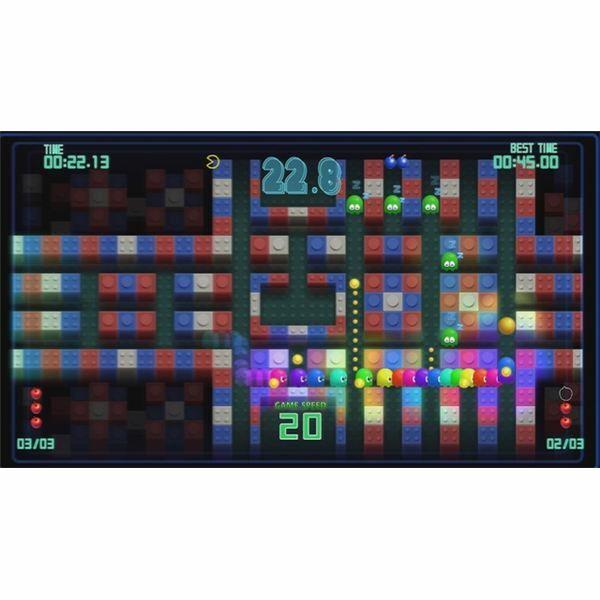 While each wall within every maze lays the foundation for the game’s look, Pac-Man, the rainbow-colored ghosts, and the hundreds of Pac-Dots that appear on screen all decorate each level beautifully and effectively. Admittedly, I’m not much of a techno fan; however, the soundtrack for Pac-Man Championship Edition DX is quite possibly the most enjoyable collection of songs I’ve heard in a video game in quite some time. Though there are only a handful of tracks, each of them gets you pumped for the in-game action. The menu theme is loud and catchy, and the varying level tracks range from rapid and heavy to slow and smooth. It is an awesome set of songs that really fit well with the classic arcade sound effects. Pac-Man’s signature “wakka wakka wakka” is just as memorable as ever, but quite possibly the best sound effect in the game is that which is caused whenever the little guy eats those dastardly ghosts. As you eat ghosts in succession, the sound gets progressively louder, making you feel more and more awesome as you bring defeat upon those who chase you so maliciously through the mazes. It’s satisfying, it’s loud as heck, and it’s beautiful. Pac-Man Championship Edition DX is in no way a one-trick pony. Time Trials mode requires you to eat a predetermined amount of fruit before the clock runs out and invites you to try again and again (and again) to best your fastest time. Ghost Combo challenges you to lead an increasing pack of ghosts until you ultimately eat a Power Pellet, turn around, and munch them all down, tallying off a high total of ghosts. And Score Attack, quite possibly the most addictive mode of them all, dares you to challenge yourself as you attempt to accrue ridiculously high scores within the allotted time. 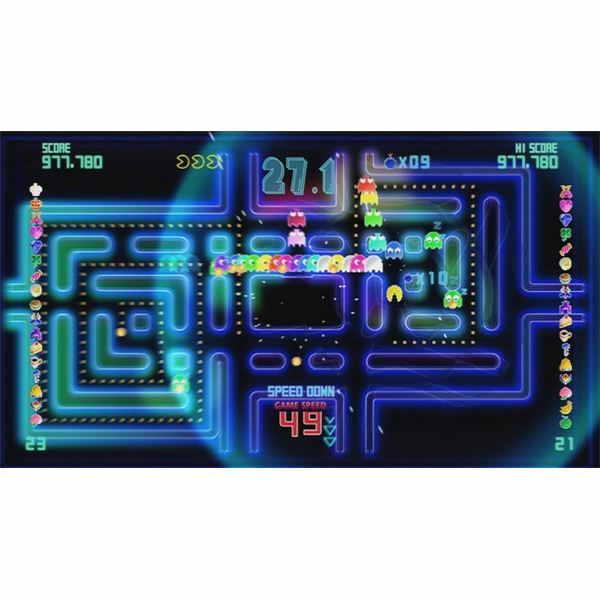 Regardless of whether you’re trying to improve on your own personal high score or challenging the online leaderboards, this dose of Pac-Man will keep you enthralled for a very long time. I’ve earned all of the trophies and completed every mode in every level and I’m still dedicating most of my free time to the game. It's just that gripping. Pac-Man Championship Edition DX is the kind of game you go to sleep thinking about and wake up wanting to play. It’s the kind of game you wish you were at home playing instead of being out and about. 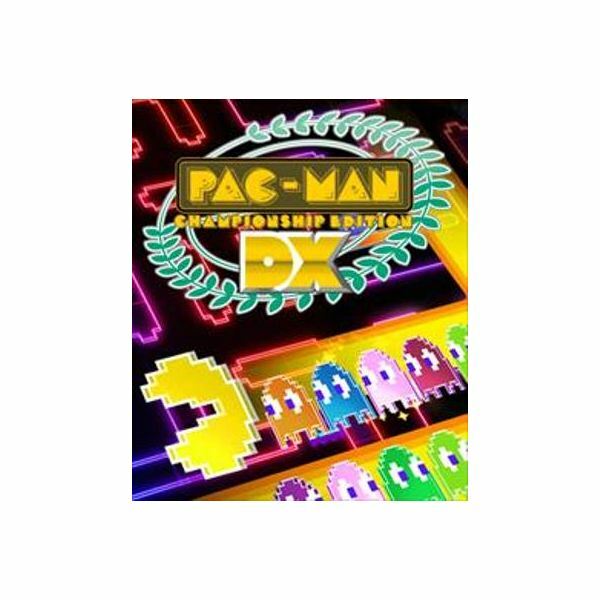 Simply put, Pac-Man Championship Edition DX is the type of experience that compels you to play it over and over again, because it never gets old, and it never ceases to surprise and impress you. At $10, you are getting one heck of a game that will keep you busy for countless hours and entertained for a long time to come.